Alaska West, Alaska | Tailwaters Fly Fishing Co.
Anglers first travel to Anchorage on Saturday and overnight in one of our recommended hotels. On Sunday morning, guests board a charter plane for the 90 minute flight to Quinhagak following a brief layover in Bethel, Alaska. From Quinhagak, guest are transported in jet-boats approximately 25 minutes upstream to camp. The following Sunday, guests take the charter from Quinhagak back to Anchorage with an identical layover in Bethel and can plan on arrival into Anchorage around 2:00-3:00PM for connections to the lower 48. Anglers tackle the Kanektok on board aluminum jet-sleds and will generally split time between floating/drifting and wading. Depending upon when you visit and what salmon are in the system, anglers fish for trout with all techniques including mouse fishing, swinging leeches, or dead drifting egg patterns. The Kanektok is a very popular king and silver salmon fishery, char eat anything, and the small rod dry fly fishing for grayling is reliable and a blast. The Kanektok is the perfect river to learn to spey cast – and Alaska West has a cult of repeat anglers during the king season using 2-handed rods. Choosing a date to fish anywhere in Western Alaska depends on which species of fish you would like to target. Fishing is excellent any time in the season, but the conditions and species available vary from month to month and may impact when you decide to visit. All months are excellent for viewing wildlife. From mid-June to mid-July, king salmon are the most popular target, with rainbow fishing picking up in July as well. The second half of July provides a shot at the salmon grand slam (all five species, all on flies, in one day), and the most varied rainbow fishing. 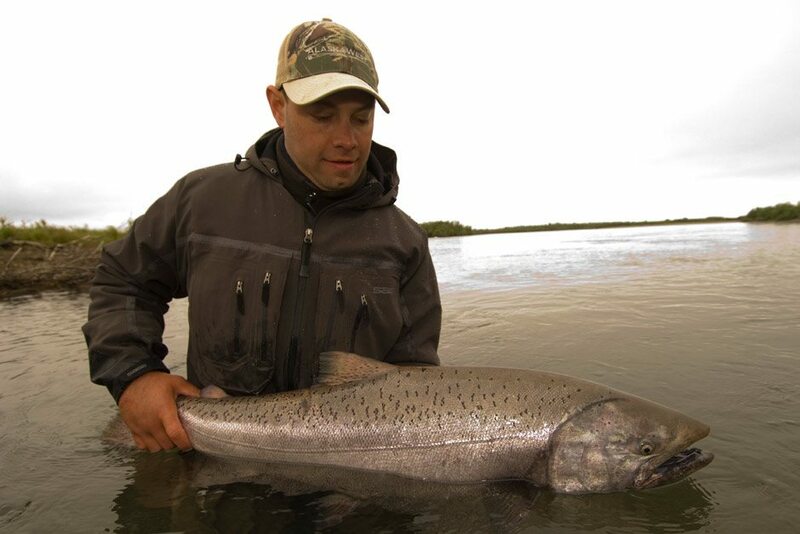 In August and early September, silver mania sweeps the Kanektok and the trout just keep getting fatter as fall arrives. Is Alaska West Right For You? Nothing about the Alaska West Camp is fancy or upscale. If you are looking for high thread count sheets, this is not the place for you. However, if you are interested in spending long days on the water fishing hard with some of the best guides in the business along with wonderful food at an affordable price, then look no further. 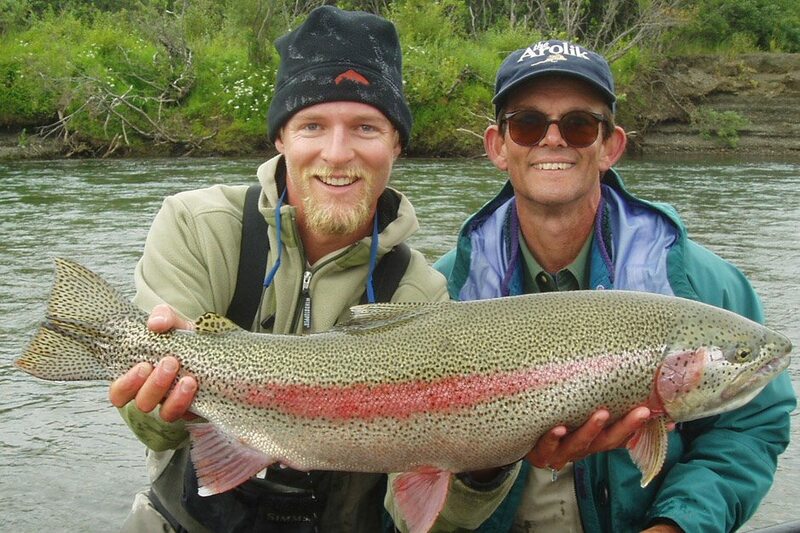 The Alaska West camp is tailor-made for anglers who want to maximize the ‘hard-core’ angling experience for rainbows, all species of salmon, char and grayling. Rates are inclusive of all guided fishing, accommodations, meals, use of fishing equipment and waders/boots (upon request). Additional expenses include but are not limited to airfare to Anchorage, hotel accommodations in Anchorage when applicable, charter flights between Quinhagak and Anchorage (approx. $740); gratuities and alcoholic beverages. (See RATES for details). 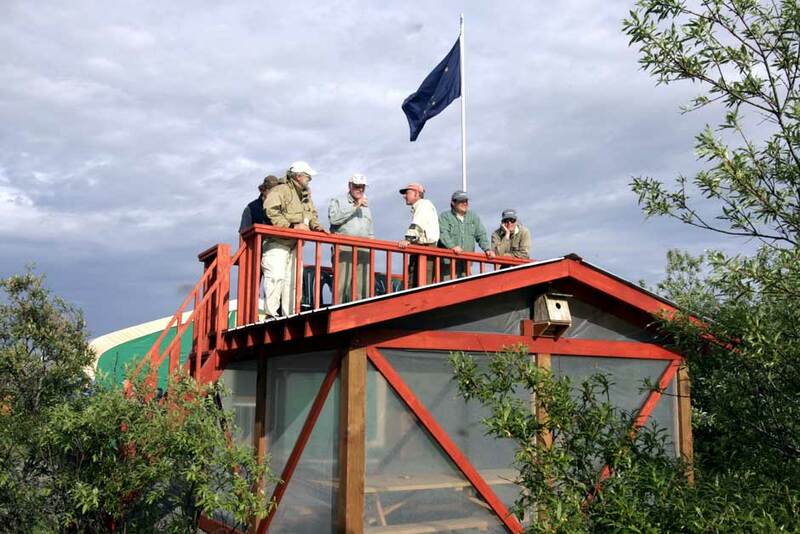 The idea behind the Alaska West operation is very simple: take a sophisticated tent camp program with clean and extremely comfortable accommodations equipped with all the amenities of home. 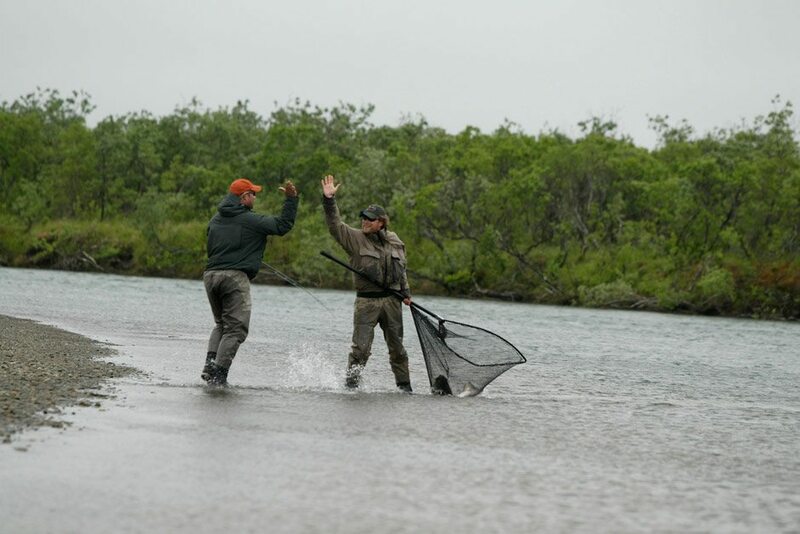 Now employ it with the hardest working guides and staff you can find and drop it on the banks of one of the greatest all around Alaskan freestone rivers – the Kanektok. The Kanektok River is a one hundred mile gem of a fishery located in the Togiak National Wildlife Refuge. It is a river that offers up everything the Alaskan angler expects . . . all five species of salmon, beautiful leopard rainbows, arctic char, and grayling. It is a winding river with differing characteristics through each section. The lower and deeper sections of the river demand a little more fishing ‘drift style’ on board one of the lodge’s fleet of aluminum boats (with jet propelled 40 HP outboards). However, wading opportunities are common on the lower sections between deeper runs, and the sections upstream of the lodge are wider, shallower, and braided — ideal for wading. Alaska West is certainly not the “fanciest” operation in Alaska . . . not even close. 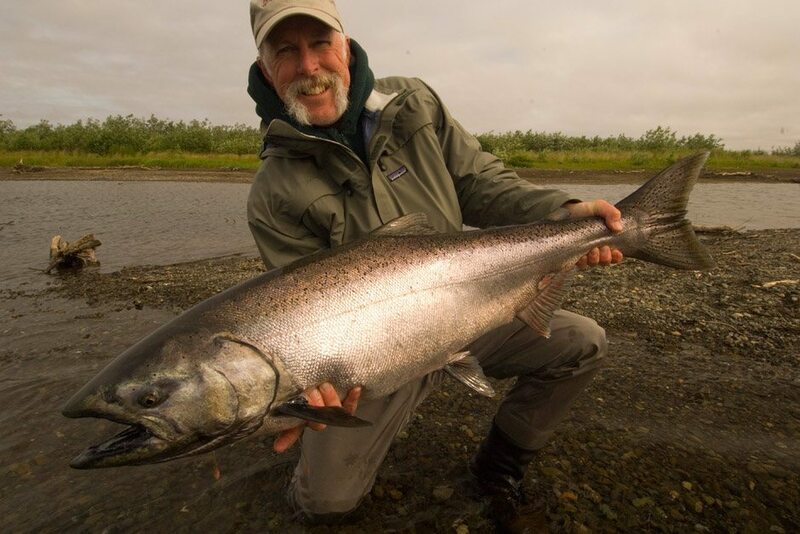 The Alaska West experience is all about the fishing. Of course, they provide comfortable and clean accommodations, delicious food, and excellent service, however the spirit of a trip with Alaska West is to spend a lot of time of the water fishing hard. 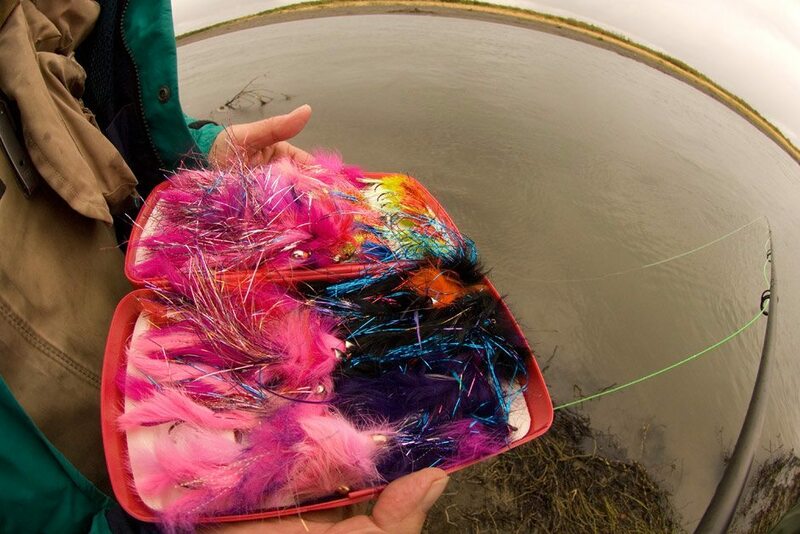 The Kanektok is one of the few fisheries in Alaska where everything an angler needs is in ONE spot! Alaska West is located on the banks of the world famous Kanektok River, in southwest Alaska. The lodge is situated five miles upstream from the mouth of this classic hundred mile freestone and the native village of Quinhagak. Quinhagak is a coastal community in the southernmost reaches of Kuskokwim Bay, along the coast of the Bering Sea. It is 425 miles WSW from Anchorage, 75 miles due South of the hub village of Bethel and 190 miles WNW from Dillingham. Basically, Alaska West is right in the middle of nowhere. The Togiak National Wildlife Refuge encompasses over 4 million acres of lands that the US government deemed appropriate to manage by the objectives set forth in the National Wildlife Refuge system’s directive to, among other things, conserve fish and wildlife populations and habitats in their natural diversity. Its northern border is the Yukon Delta National Wilderness Refuge. Its Eastern border is the Wood Tikchik Lakes and Wood Tikchik State Park. The southern border is Bristol Bay, and the western border runs 50 miles inland of Goodnews and Platinum until it bisects the Kuskokwim Bay coastline. Several villages fall within the refuge’s boundaries including Eek, Quinhagak, Platinum, Goodnews, Manokotak and Togiak. The refuge is mainly comprised of coastal flats, river flood plains & high tundra plains. Two mountain ranges run through the refuge — the Kilbuck range and the Ahklun range. Both are heavily eroded by ice, wind and water, and their highest peaks are less than 4,500 feet high. The area provides habitat to over 48 mammal species, 31 of those land-bound, including caribou, wolves, moose, brown and black bear, foxes, beaver, muskrats, minks, river otters, voles and porcupines. 17 marine mammals live in the refuge including sea lions, walruses and whales. Three main river drainages host all five species of pacific salmon, rainbow trout, Dolly Varden, arctic grayling, arctic char and pike. 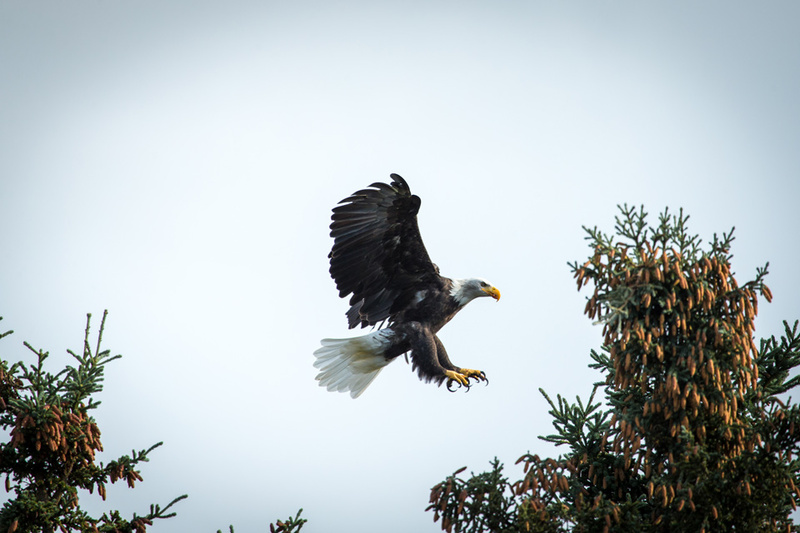 Over 200 bird species nest in the refuge including golden and bald eagles, peregrine falcons, murres, plus many species of waterfowl and shorebirds. Willow and cottonwood make up the scrub forests along the riverbanks and the tundra is flush with lichen, berries, dwarf trees and grasses. Alaska West is certainly not the fanciest operation in Alaska . . . not even close. The Alaska West experience is all about the fishing. Of course they provide comfortable and clean accommodations, fabulous food, and excellent service, however the spirit of a trip with Alaska West is to spend a lot of time of the water fishing hard. Your pocketbook will also not suffer when booking a trip with Alaska West, as their price tag is not nearly what anglers shell out for a traditional fly-out lodge these days. The Kanektok is a river system with many different characters. 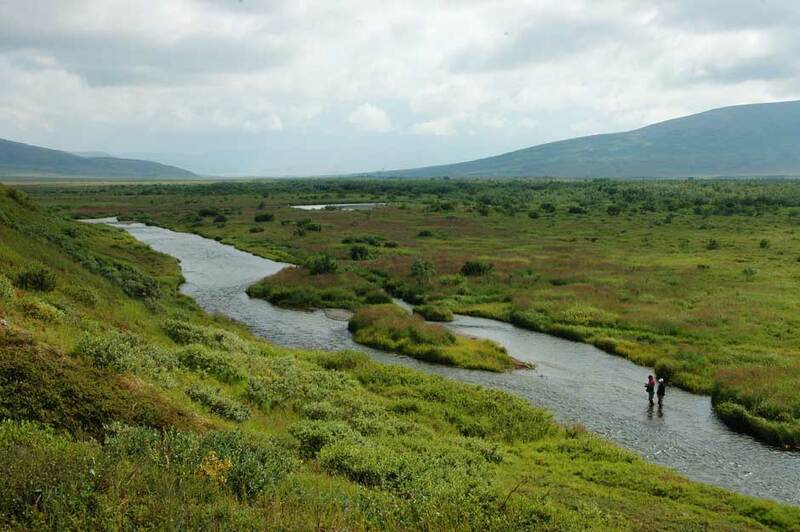 The headwaters of the Kanektok are a tiny trickle on a gravel bar, and it dumps into the Bering Sea one hundred miles later as an impressive navigable river flowing at several thousand CFS. It is winding river lined with cottonwoods and willows. The lower sections of the river demand a little more fishing ‘drift style’ on board one of the lodge’s fleet of aluminum boats (equipped with jet propelled 40 HP outboards). However, wading opportunities are common on the lower sections as well between deeper runs. Upstream from the lodge the river is much wider, shallower, and braided — ideal for wading. Boats are outfitted comfortably with ample storage, removable chairs, and can access the skinniest of water . . . delivering anglers conveniently to every beat of the river. The water on the Kanektok is always easy to read, with first time anglers identifying the gravel bars loaded with char, the pods of salmon stacked up in back eddies, or the logical cut banks holding the river’s famous leopard rainbows. The watershed is most famous for its amazing run of all five species of salmon, in addition to world renowned rainbow trout fishing. Other anadromous species such as Dolly Varden and Arctic char congest the river in huge numbers, not to mention loads of grayling. The Kanektok is known as a river that receives epic runs of all salmon species as well as exploding trout populations. The Kanektok is one of the few fisheries in Alaska where everything an angler needs is in ONE spot . . . no need to invest in expensive fly-out trips each day. Spey or two-handed fly rodders from around the world will attest that the Kanektok is ground zero for chasing king salmon. The character and style of the river sets up perfectly for experienced and novice anglers to have success with the mightiest of all the salmon with two-handed fly rods and conventional gear alike. Of course you could walk across the river on the backs of sockeye, pinks, and chums nearly all summer long, however late July through the end of the season brings the cooperative and aggressive silver salmon to the Kanektok. Thousands upon thousands of silver (coho) salmon return to run the Kanektok to spawn each summer, providing Alaska West guests with one of the most consistent fisheries for this acrobatic species. No Alaskan experience would be complete without targeting big rainbows, and the Kanektok is home to a huge population of the eclectically spotted leopard rainbow trout throughout nearly all sections of the river. Trout are consistently taken using a variety of methods including egg patterns, leeches, and most notably the Kanektok offers some of western Alaska’s best mouse fishing when conditions are favorable. 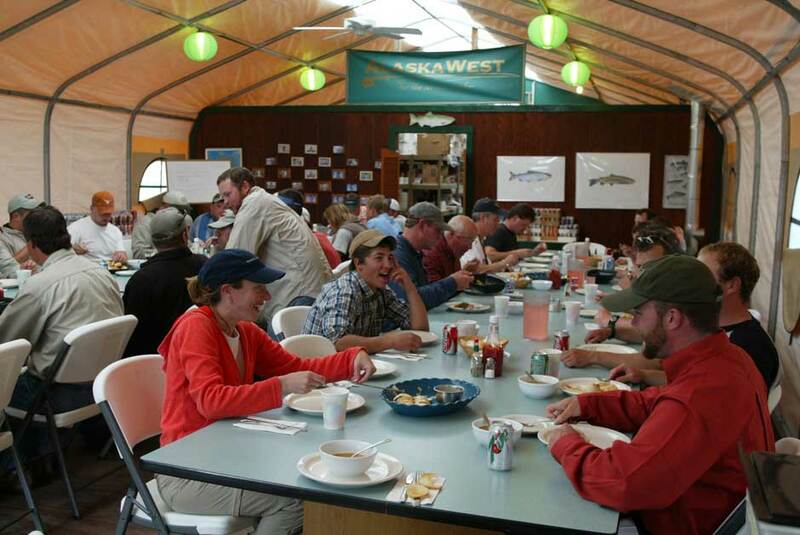 The Alaska West facility is a “luxury tent lodge.” It is made up of a combination of permanent and semi-permanent structures, and is designed to combine comfortable living, eating and lounging areas with a location right on top of a phenomenal river. The dining tent is a spacious 24’x 60’ heated structure with wood floors and is always kept neat and clean. The kitchen has state-of-the-art equipment such as gas ranges, convection oven, microwave, refrigerators and freezers. The lounge is great place to relax after a full day of fishing. This large heated tent is furnished with comfortable chairs and tables. At your disposal are a refrigerator with cool soda, juices and mixers, poker chips with cards, board games, dart board, magazines, books, map board, telephone, satellite television and an online camp computer. There is a fly tying bench with a limited supply of fly tying materials and vises. After returning from your day’s fishing adventure, this tent serves as a place for you to hang your wet waders, coats, boots and anything else you don’t want wet or dirty in your sleeping quarters. This split-level wood structure has a great river view. The bottom area is open-air and enclosed with fine mesh bug screen. This is a great place to sit and enjoy the midnight sun without being bothered by our little biting buddies. Directly above is the viewing deck. 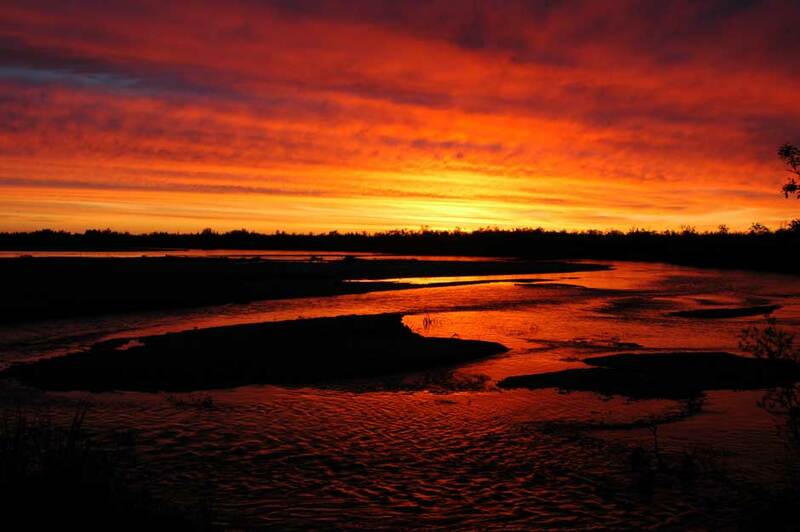 Bring your camera – the sunsets can be breathtaking! Showers have hot and cold running water with a sink basin and chair. They are cleaned daily. The restrooms are outhouses are also cleaned daily and strategically located near your tent cabin. 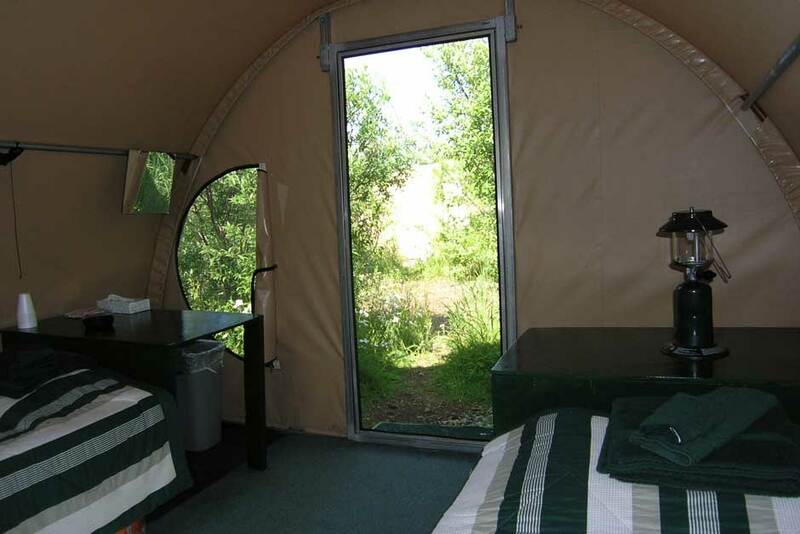 Heated tent cabins are furnished with two single beds with full bedding and pillow, clean shower linen, nightstand, hang-down bug net, lantern, carpeted floor and clothes hangers. Housekeeping staff come through daily to make beds, empty trash and tidy up to ensure your home for the week stays neat and clean. Alaska West operates on a 7 Night / 6 day Sunday – Sunday weekly schedule. For most guests, the first leg of the trip to Alaska West is accomplished by reaching Anchorage on the Saturday before the Sunday arrival at camp. Guests overnight in Anchorage, typically at one of our recommended hotels. 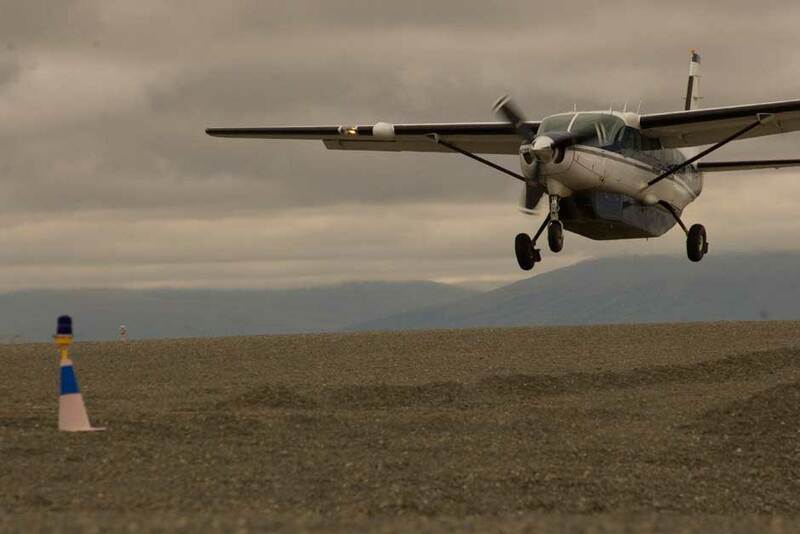 The second leg of the trip leaves Anchorage Sunday morning on board a round-trip charter service with Era Aviation from Anchorage with a connection in Bethel to the little village of Quinhagak, at the mouth of the Kanektok. Once in Quinhagak, anglers travel upstream approximately 25 minutes by jet boat to the lodge facility. There is no fishing on the day of arrival. After six full days of fishing, the process repeats itself the following Sunday. The charter flight returns to Anchorage mid afternoon. Guests have the option to overnight again in Anchorage; however, with many “red-eye” flights to the lower 48, guests may continue on homeward from Anchorage on Sunday evening with a Monday morning arrival home. Anglers travel to Anchorage and overnight at a recommended hotel. Anglers travel on board a ninety minute private charter departing Anchorage at 9:30 a.m. to the local native village of Quinhagak after a short layover in Bethel. Upon arrival in Quinhagak, anglers are met by a representative from Alaska West and transported upriver 25 minutes to the Alaska West facility. Anglers usually arrive around 5:00 p.m., unpack and rig gear, have a cocktail, and get prepared for the next six days of fishing. There is no guided fishing on the day of arrival. Six full days of guided fishing on the Kanektok! Guests follow a similar procedure flying back to Anchorage with a layover in Bethel on board a private charter flight arriving back into Anchorage early afternoon around 3 p.m. Most flights from Alaska to the lower forty-eight are overnight red-eye flights which depart in the evening, allowing plenty of time to catch a connection onward home. Guests originating in the Pacific NW can easily make it home Sunday night. Alaska West operates from early June through the first week in September. Fishing in general is excellent any time in the season but the conditions and species available vary from month to month and may impact when you decide to visit. During this period, the Kanektok isn’t yet clogged with salmon. 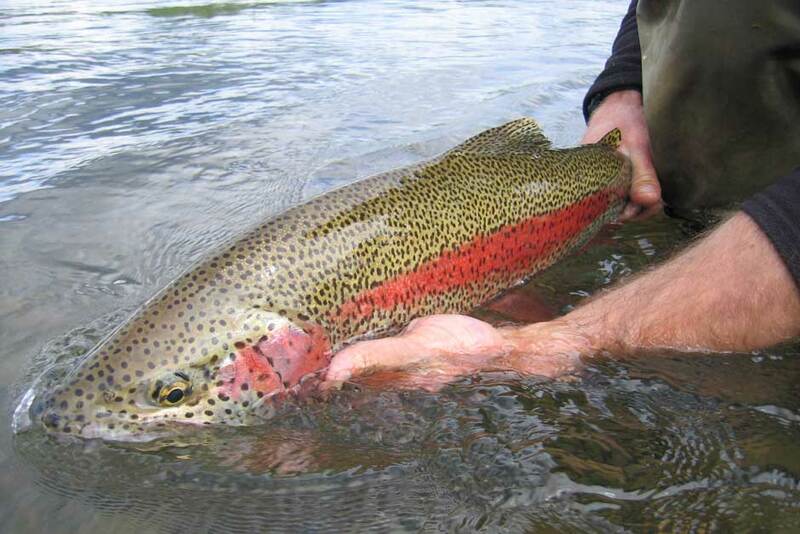 Rainbows are hungry after a long cold winter, and they’re really opportunistic feeders. Covering lots of water with big flies is generally the ticket. Sculpins, leeches, big flesh flies, and some opportunistic mouse fishing can make the early season a home run! This is generally the peak time for trout numbers. A wide variety of techniques applied in lots of different water all produce fish. Side channels, spawning beds, mid-river snags, shelves and the couch water get fished and the fish tend to do their part. Beads, flesh in a range of sizes, and the standard leech and sculpin patterns remain favorites. Mousing is awesome. BONUS: salmon grand slam, dollies, grayling! Time to look for Big Jerry. Kanektok rainbows get fatter and fatter as the season goes on, so late is good if you’re hoping for the fish of a lifetime. The trout tend to be a little more concentrated later in the season, so it’s important to spend your time in the right water. Side channels are less of a factor as the river drops. Upriver spawning beds and lower river snags are favorite spots. The couch water on inside bends still produces. A variety of flies get fished, but beads and smaller flesh patterns are the stars in the late season. BONUS: silvers, silvers and more silvers! 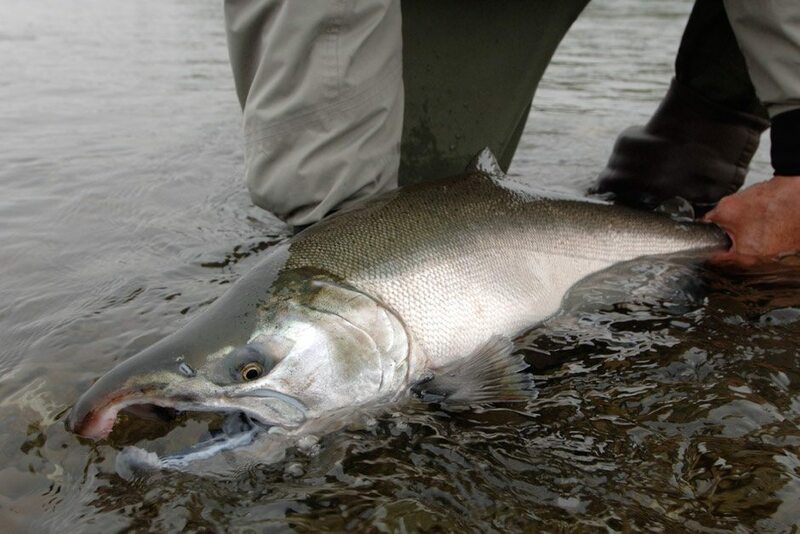 The month of June is marked by the arrival of the mighty Chinook, or king salmon. This is the time to try a hand at swinging flies for these giants. Although king salmon will hang around for the month of July, the last two weeks in June and first two weeks in July are considered prime time. Chums and zillions of pinks also begin arriving in great numbers toward the end of the month. July is a month noted for its huge variety of options including the peak of the sockeye and chum runs as well as the addition of the pink salmon — and the beginning of the silver run. Throw in the longest days of the season, mild weather, the dollies, char and grayling — and you have one of the best all around months fishing the Kanektok and Arolik. Hard fighting chums are still around through mid August, however this is predominantly the month of the Coho, or silver salmon, which is the most acrobatic and eager of the five pacific salmon species. The silvers continue to pour into the river system until the lodge closed in early September. Fishing is the predominant activity at Alaska West. However, everyone (non-anglers included) should experience the Alaskan wilderness, with all of the solitude, incredible scenery and wildlife that go along with it. There is no better way to do it than on a remote Alaskan fishing trip. 7 Nights double occupancy accommodations; 6 Days guided fishing with shared guide; Daily housekeeping; Three meals per day including non-alcoholic beverages; Loaner fly rods & reels, flies, tackle (bringing your own gear encouraged but not necessary with notice). Tailwaters Travel must adhere to the cancellation policies of the guides and lodges which it represents. Alaska West’s policy follows: A $500 deposit is required to hold all reservations made outside of 180 days from the trip. This $500 deposit is fully refundable for thirty days following receipt of deposit. 180 days prior to scheduled trip, a 50% deposit less the $500 deposit is due to confirm each angler’s spot. 30 days prior to the trip full payment is required. All monies received within 180 days from trip are NON-REFUNDABLE. Refunds of deposits/payments made on credit cards will be charged a 3.5% service charge to fully compensate Tailwaters Travel for all bank charges incurred. Receipt of deposit and/or final payment is acknowledgment that registrant has read and accepts the cancellation, refund and responsibility clauses.